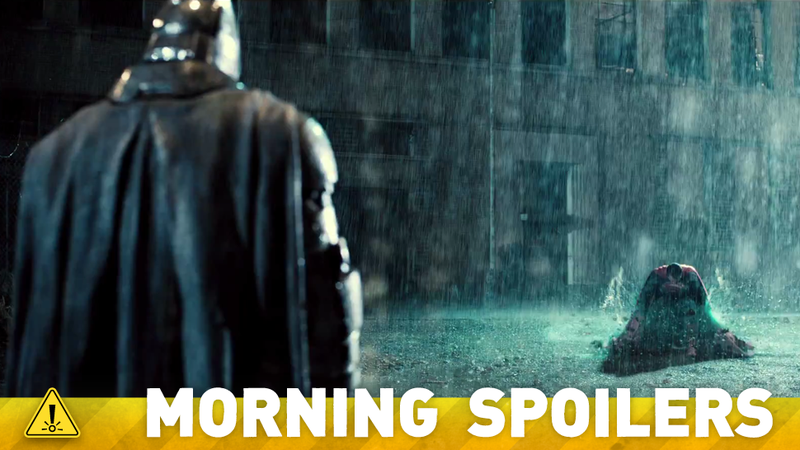 Does The Batman V. Superman Trailer Hide A Huge DC Universe Easter Egg? We know who’s writing Captain Marvel. Find out when we’re getting the next Transformers movie. See Captain America: Civil War set photos, and cool posters for Batman v. Superman, Fantastic Four and Tomorrowland. Could Diggle suit up in the next season of Arrow? Plus, Robin Lord Taylor talks Gotham. So many spoilers! Our plan with the studio and filmakers you may have heard some writers being hired and we have in fact brought in Akiva Goldsman to lead a group of writers to really create a strategic plan around Transformers. We think there are any number of stories to be told from the brand that has been around for 30 years with amazing canon and mythology. We would expect the sequel to the Transformers movie [TF4] to happen in 2017. Comic Book speculates that there’s a brief tease of what could be Robin’s suit, hanging in a case, in the background of a shot in the new trailer. This could help confirm rumors that Robin (Jason Todd, possibly) has died before this movie begins. Well, as we’ve seen through the whole season, he’s gradually, bit-by-bit, been asserting himself as his own man, and his end goal is to not have to answer to anybody — to be his own boss. We’ve seen that in the pilot, when he goes behind Fish’s back and they have their thing, and then we see it when he aligns himself with Maroni, goes behind his back and is working with Falcone the whole time. What we’re going to see in the final four is the final push. He sets some things in motion that affect everyone in the show. Everyone in the show will be affected by what he does in the last four episodes, and it really is his final assertion to being his own boss, to being his own man. And, it’s crazy. I don’t know what else to say — I can’t get too specific. Fish is a huge part of that. But it’s interesting, and it also really brings to the forefront — hopefully this is what people will see — the complexity of their relationship. Like, I know that they are arch-enemies, but at the same time, he has affection for her, because he wouldn’t be where he is if it wasn’t for her. He learned everything about Gotham City, about the underbelly of Gotham City — he learned it from her, and all of the rules and all of that. So he does have reverence for her and really does care about her. You’ll see, there’s conflict there that is also going to be illuminated in the last four episodes. “Lily” – Emma’s potential for darkness is looming over everyone, but when Emma realizes Maleficent’s daughter Lily is in fact her closest friend from her foster care days, she resolves to find Lily and reunite her with her mother. Regina joins forces with Emma and together they set out to track down Lily and to warn Robin about Zelena. However, neither of them is prepared for the harsh realities they’ll encounter in the outside world. Meanwhile, in Storybrooke, Gold faces a crisis involving Belle. In a foster care flashback, things are looking up for young Emma with her new family until Lily’s appearance threatens to destabilize everything, on “Once Upon a Time”. “The Last Death of Henry Morgan” – Henry and Adam have been on a long, unrelenting collision course, which is about to come to a head – possibly bringing about one man’s death – with only Jo standing in the way. Henry and Jo’s murder investigation into a museum worker’s death centers on a priceless missing ancient dagger, which not only ended the life of Julius Caesar, but also killed Adam the first time. Meanwhile, Adam knows that there is something that Henry fears more than death – that Jo might discover his mystery. The two men tangle in a tumultuous game-changing confrontation. But at long last, will Jo finally learn about Henry’s secret? TVLINE | She makes a very altruistic move in the trial scene to save Claire. Where do you think that comes from? What’s interesting is that, having said that Geillis is calculating, you would maybe never expect her to be so altruistic, right? But, the cause that she’s fighting for is, in a way, altruistic. She’s an idealist. And that’s not how she strikes you at first. You think she might be selfish or she might just be after her own good. But then when she is so altruistic and basically sacrificing herself for Claire, you’ll come to see that she really has come to love Claire. Maybe Claire is her only friend. There’s a loneliness to Geillis as well that makes her want to be friends with Claire. TVLINE | When would you say that Geillis locks onto the fact that Claire is not from this time? She knows. I believe she knows from the start. I believe she knows this, and from the moment she meets Claire, she’s just wanting Claire to confide in her which she only does later on. But she wants a certain honesty. But she knows. She always knows. Following Mary’s public chastening, the recently-minted Magistrate Hathorne steps up his bid to wrest power over the citizenry of Salem from her, forcing Mary to once again compel her bewitched husband to take action. When Hathorne levels a not-so-veiled threat against Anne Hale – which he mitigates with an unappealing solution - it prompts the young Witch to seek Mary’s council. She receives sound advice... but it comes at a fearful and unappealing cost. Mercy Lewis’ grisly preparations to enact her revenge reach new heights, drawing two reluctant participants closer in the process, and forcing the hand of one of her increasingly tenuous allies. Meanwhile, as John Alden continues to pursue his righteous task, his search for answers yields valuable results, and Mary takes the fight directly to her newest foes... with surprising results.